A conventional system has two water tanks in the loft, a large ‘cold water storage tank’ and small ‘feed and expansion tank’. The ‘cold water storage tank’ draws water from the cold water mains to refill. Water from the storage tank feeds cold water down to the cylinder (normally in the airing cupboard). 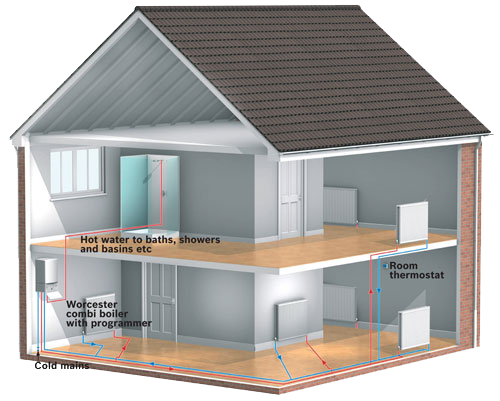 The central heating boiler will heat the cylinder and converts cold water to hot, this then enables the cylinder to release gallons of hot water to taps throughout the house. The ‘feed and expansion tank’ is usually smaller and maintains the correct level of water in the heating system. It also allows for expansion of the water in the radiators and pipework when it gets hot. A real benefit of this system is that showers, taps and running baths can be drawn in any room at the same time; not all systems can do that. If the cylinder does run out of hot water it will have a fast recovery rate of 25 to 30 minutes (with a new boiler and cylinder). The boilers listed below are available in a range of outputs and are all compatible with a conventional system. Combi’s are now the best selling boiler type for gas central heating in Britain. They”ve been proven steadfast, reliable and tough. Some combis will settle snugly into an average cupboard, if not a cupboard could be built around the boiler after installation. They are economical to run. And can certainly produce an endless supply of hot water. But it has to be mentioned, that the flow may be limited if other taps are running simultaneously. That said, it provides almost instantaneous steaming hot water literally on tap. Whenever you need it. There is no storage cylinder to heat first or to run cold. There will be no cold water storage tank to find space for and no feed and expansion tank needed. So ask yourself if there is such a great demand for simultaneous hot water around the home. If the washing machine, bath and shower aren’t competing for water at the same time, the combi really could be the answer for your home. Around one quarter of Britain’s carbon monoxide emissions originate every year from the the energy we use to heat and light our homes. It”s because we burn fossil fuels (gas) to produce that energy. And over time the resulting waste gases do add to the effect of global warming. To a degree just changing an older style boiler to a new conventional or combination boiler (around 80% efficient) is a big step in the right direction, any boiler over 15 years old is inefficient (approximately 50% efficient), wasting natural resources and your money. But if you feel that you want to make a positive statement; you’d like to really reduce emissions and your gas bill you may want to consider a ”High Efficiency Condensing Boiler” (around 91% efficient). Yes it is a little more expensive initially. But you”ll gain in the long term when you notice that your fuel bill has been reduced substantially. In some homes more than one third. 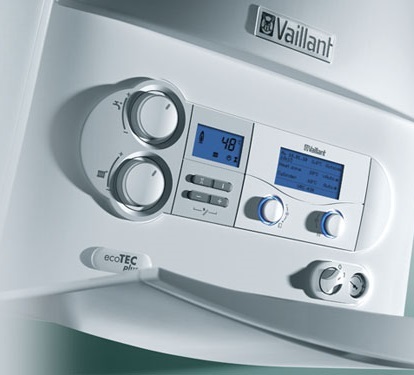 For an example if you have decided on a ”Combination boilder” Vaillant Turbomax 828 E, you could upgrade to the Vaillant Ecomax 828 2E ”Condensing boiler”, the radiators and hot water will have the same heat up time and flow except the standard combination boiler (Vaillant Turbomax) will be around 80% efficient and the condensing combination boiler will be around 91% efficient. But it has to be mentioned, these boilers need to have a lot of thought when it comes to the position of the boiler and the flue, this is because there is a large amount of ”Pluming” (steam / water vapour) which comes out of the flue outside, consideration ned to be taken regarding neighbouring properties and boundary lines. We can survey your property and help you to decide the best place for your condensing boiler.